Released on September 4, the book features photographs of celebrated talents such as Julianne Moore, Keira Knightley, Juno Temple, Mena Suvari, Nina Dobrev, Danielle Brooks, and Gugu Mbatha-Raw, all representing this very spectrum of emotions, specifically focusing on losing or leaving love. These intimate images, some of which are featured below, are seven years in the making and we sure are glad it is finally out for the whole world to see, relate and enjoy. 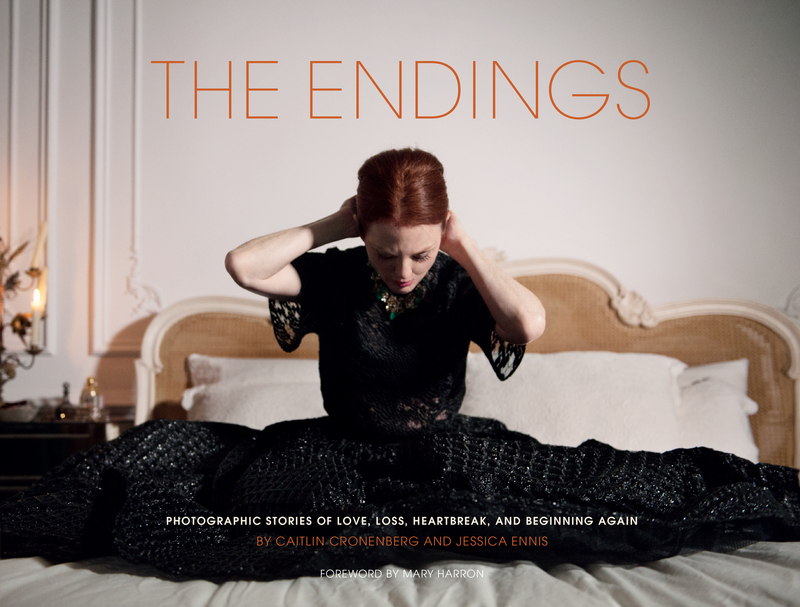 Jessica and Caitlin detail their process and the journey of bringing ‘The Endings: Photographic Stories of Love, Loss, Heartbreak, and Beginning Again’ to life in a recent interview with Meaww. The concept of “sadness, loneliness, anger, relief, rebirth, freedom, and happiness” sounds phenomenal. Could you tell me a little bit about singling in on this theme and how to go about it? Basically, we felt like the topic of relationships, specifically relationships ending, is something that allowed us to show the entire spectrum of the human experience. From elated to devastated and everything in between, relationships are something that leaves us at our most vulnerable, whether the experiences are positive or negative. We found that relationship stories bonded us together, and they really bond women together in general. Everyone has a story to tell whether it is theirs or somebody else’s. You can’t escape it. I understand that each of these themes was inspired by fictional stories inspired by real-life experiences. Could you tell me a little bit about these stories, how they were written/imagines? When women get together, they talk and bond. A very common topic of conversation among women is relationships and the way they end. We all have our own experiences, but talking about them can bond us together and make us feel closer. We used many of our own experiences to come up with the stories in the book, and we talked to friends and friends of friends as well. Together we would write out a detailed story to share with each actor, and then create a visual mood to go along with that story. We made sure that the actor had a fully developed story and character and then they would take it from there. You have some really big artists modeling for you. What was the selection process like and how did you match the model to the theme? It varied from story to story. Sometimes we’d have the idea for the story first, and we’d cast an actor based on who we thought would be best. Other times we would reach out to actors we loved first, and if they liked the concept of the book, we’d find which story we felt would be the best fit for them. There were so many amazing women we wanted to work with, but sometimes schedules got in the way. When you go into the shoots, do you have a very clear and specific idea on what the theme would be, or do you go in with a general concept and sharpen it as the shoot progresses? We would go in with a very specific direction, and then we’d let the actor improvise based on how they felt the character would act. We always encouraged the actors to take it and run with it, and the process was an organic growth of the story and beautiful collaboration between artists. Personally, what were the favorite shoots for each of you? What makes those special? Caitlin: I really loved the Noomi Rapace shoot. She was so emotional and beautiful and gave so much to the character. She was so far into the world of this character that we felt like we shouldn’t even disturb her while she was acting. It was truly remarkable to watch. Caitlin, your photos have been featured in some of the biggest magazines worldwide. How has this experience been different? Does the fact the book is your baby give you more freedom with the work or have you been afforded that luxury even on other jobs? There was a lot of freedom in not having to answer to a client on a job, but that can be overwhelming too. Sometimes too much freedom is just as much of a challenge as working within specific parameters. I think what I learned was that it’s ok to take a photo that is out of focus. It’s ok to let your subject just exist before you. It’s not always perfect, but that’s not the point. The point is to capture real emotion however you have to do that, and that’s what I think we did. It really allowed me to hone my technique and now I apply a similar shooting style to all of my shoots. What is working with Mary Harron like? Having worked on some of the biggest and popular projects out there, how did her input impact your vision and endeavors for the project? We brought Mary in to write the foreword when we were already almost finished the book. It was important for us to show the content to the person writing the foreword so they could get an idea of the scope of the work. We both admire Mary and have for years, so we were thrilled that she was excited to come on board. She was very curious about the process we used to create the stories, and we talked for hours and hours about everything. It’s really fun to talk about the process with another director who has her own process, to see how they differ and how they are similar. Mary did tell us one breakup story about a friend of hers who cut up all of her husband’s clothes into tiny pieces, so we used that idea as the last story we shot and the last story in the book. If you were to make a sequel for ‘The Endings Photographic Stories of Love, Loss, Heartbreak, and Beginning Again,’ what would the theme be? Could you think of a tentative title for the same? I think we covered SO much on the subject that we will need the next one to be about something entirely different. My vote is ice cream. Having gone through the whole process, - if you could - what advice would you give yourselves from when you started a project? Get talent to sign release forms as you shoot them instead of 7 years later!